The setting is grandma’s living room. Four cousins are snowed in and the power is out: no video games, no TV, no movies, no cell phones, and the list goes on…the total bummer! And so begins The Christmas Puzzle from creative team Carter and Barny Robertson. 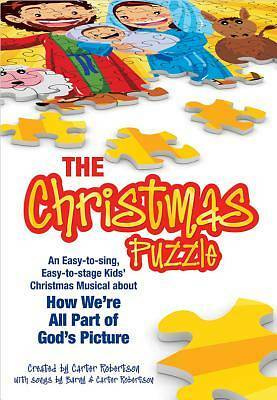 The cousins discover God’s picture perfect plan as they struggle to complete a jigsaw puzzle with nothing but clues from the Bible to guide them. This musical is designed for easy production and presentation, and easily adapts to any size stage, platform, or other performance space. The cast is made up of 4 children and 1 adult. Costuming is what children would normally wear in December, and the setting is a simple “grandma’s living room” decorated for Christmas.